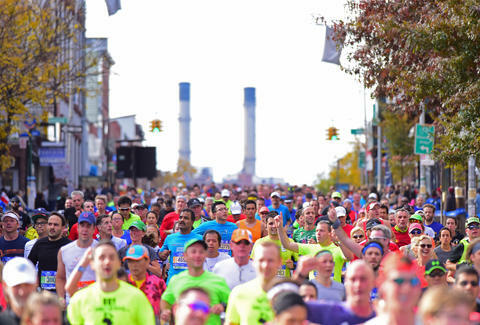 Even though the mere thought of running more than a mile may exhaust you, watching a sea of people push through a 26.2-mile course is actually quite something, especially in New York City. This Sunday, November 5, the TCS New York City Marathon -- the largest marathon in the world -- hits the five boroughs, drawing over 50,000 runners from all over the globe, and even more spectators. Here's everything you need to know, whether you want to get out to cheer on the entrants, kick back and watch at home, or simply have a heads-up on how it might snarl local traffic. When does the 2017 NYC Marathon start? The festivities kick off Sunday morning in Staten Island at 8:30am, starting with the professional wheelchair and handcycle racing divisions, followed by four waves of runners who'll begin crossing the starting line at 9:20am. Last year's winner finished in two hours and seven minutes, but the average finish time was 4 hours 37 minutes. What is the 2017 NYC Marathon course map? The race starts on the east end of Staten Island, with the course taking runners over the Verrazano Bridge, through Brooklyn, into Queens, over the Queensboro Bridge into Manhattan, up into the Bronx, and through a final stretch down Fifth Avenue and into Central Park, where they'll cross the finish line on the west side near 67th Street. For full details on the course map, nearby subway stops, and where best to catch a glimpse of the sea of runners, check out the official NYC Marathon map, or download the mobile app. What roads and bridges will be closed or affected? Because the marathon touches so many parts of the city, it's going to seriously affect traffic, so if you need to drive anywhere on Sunday, plan accordingly. Here's a full breakdown of all the road and bridge closures from the Department of Transportation. They're officially scheduled to be closed between 9am and 6pm, though you should expect some to shut down earlier than 9am and re-open before 6pm. What's the weather forecast for the NYC Marathon? According to Accuweather, the forecast for Sunday is looking pretty good, with a high temperature of 63 degrees. However, as of this writing, there is a roughly 40% chance of precipitation between 11am and 1pm. How can I find out where a particular runner is on the course at any given time? The official TCS NYC Marathon mobile app has a tracking function that enables you to keep tabs on individual runners by simply plugging in their bib number. Similarly, you can check this webpage for live results info and runner tracking details once the race starts on Sunday. If you can't make it out to cheer on the runners in person, you can catch the action locally from your couch or phone on ABC channel 7 or stream it at ABC7NY.com. It'll also be broadcast live on ESPN2 until 12:30pm on Sunday. What notable athletes and celebrities are running the 2017 NYC Marathon? If you don't have anyone to personally cheer on at this year's race, there are a few runners you may want to look out for. Meb Keflezighi, a famed marathoner who picked up a silver medal at the 2004 Olympic games and who's previously won both the NYC and Boston marathons, will be hanging up his marathon shoes after he crosses the finish line this year -- he claims this one is his last. You'll also want to keep your eyes peeled for some familiar faces, because as usual, a number of celebrities will be wearing bibs in the NYC Marathon. Tiki Barber, Kevin Hart, Karlie Kloss, Prince Royce, Caroline Radziwill, Casey Neistat, and Nev Shulman are all signed up to race this year.